Kentucky Ice Cream Shop Insurance. Ice cream is quite possibly the most universally beloved confectionery. To make sure the smiles keep coming from happy customers, you depend on your equipment and your employees. But what if your ice cream equipment breaks down or an employee is injured on the job? Would your insurance provide enough coverage to pay for repairs or medical costs? There's always a chance of possible loss, damage or theft of your utensils, damage to your kitchens, or an expensive claim if an employee or member of the public is injured or worse due to your work. That's why it's important to manage these risks and keep your business safe with a tailored Kentucky ice cream shop insurance policy. 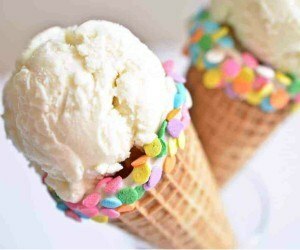 Kentucky ice cream shop insurance protects your parlor from lawsuits with rates as low as $27/mo. Get a fast quote and your certificate of insurance now. The Kentucky ice cream shop insurance is suitable for anyone who owns or manages an ice cream parlor, shop or cafe selling ice cream and frozen treats. Compared to a standard business insurance policy, a Kentucky ice cream shop insurance meets the needs of the hospitality industry. For example, you will probably find your business is seasonal so you carry different levels of stock during the year. This policy can be tailored to your requirements so you're only paying for coverages that are relevant to your operation. Business interruption: This Kentucky ice cream shop insurance policy provides coverage to make sure that if something unfortunate were to happen, you won't be out of pocket. For instance, if you suffered fire damage at your premises meaning you were unable to open, business interruption will typically cover your gross profit and fixed expenses while we get you back on your feet. This means you shouldn't be out of pocket if the worst does happen. Workers' Compensation: Workers comp is required in most states for any non-owner employees. Protect yourself with KY workers compensation that covers employees' occupational injury expenses. Employee Dishonesty: This Kentucky ice cream shop insurance coverage protects your business from financial loss in the event that one of your employees steals from your business or engages in other illegal behavior while working for you. Business Owners' Policy (BOP): BOPs are great for ice cream stores because they are affordable and they offer both the general liability, business personal property and business interruption on a single bundled policy. With this Kentucky ice cream shop insurance policy, you can obtain coverage in case a patron gets injured as well as protect your business against property claims. Owning an KY ice cream parlor is a reliable and fun way to earn a living. Ice cream is popular with all ages and can sell year round. Shops have a lot of activity in them, particularly during the busy seasons, and this introduces to more potential risks to your business. You can protect yourself from unexpected events, risks and hazards by carrying the right types and amounts of commercial insurance. Request a free Kentucky Ice Cream Shop insurance quote in Alexandria, Ashland, Barbourville, Bardstown, Beaver Dam, Bellevue, Benton, Berea, Bowling Green, Brandenburg, Cadiz, Calvert, Campbellsville, Carrollton, Central, Cold Spring, Columbia, Corbin, Covington, Crescent Springs, Crestview Hills, Crestwood, Crittenden, Cynthiana, Danville, Dawson Springs, Dayton, Douglass Hills, Eddyville, Edgewood, Elizabethtown, Elsmere, Eminence, Erlanger, Flatwoods, Flemingsburg, Florence, Fort Mitchell, Fort Thomas, Fort Wright, Frankfort, Franklin, Georgetown, Glasgow, Graymoor-Devondale, Grayson, Greenville, Harrodsburg, Hartford, Hazard, Henderson, Highland Heights, Hillview, Hodgenville, Hopkinsville, Hurstbourne, Independence, Indian Hills, Irvine, Jeffersontown, La Grange, Lakeside Park, Lancaster, Lawrenceburg, Lebanon, Leitchfield, Lexington-Fayette, London, Louisville, Ludlow, Lyndon, Madisonville, Marion, Mayfield, Maysville, Middlesborough, Middletown, Monticello, Morehead, Morganfield, Mount Sterling, Mount Washington, Murray, Newport, Nicholasville, Oak Grove, Owensboro, Paducah, Paintsville, Paris, Park Hills, Pikeville, Prestonsburg, Princeton, Prospect, Providence, Radcliff, Richmond, Russell, Russellville, Scottsville, Shelbyville, Shepherdsville, Shively, Simpsonville, Somerset, Southgate, Springfield, St. Matthews, Stanford, Stanton, Taylor Mill, Union, Versailles, Villa Hills, Vine Grove, Walton, West Liberty, Wilder, Williamsburg, Williamstown, Wilmore, Winchester and all other cities in KY - The Bluegrass State.